With a rapidly rising population and demand for housing diversity and affordability in appropriate locations, the pressure for urban consolidation in middle ring suburbs remains strong. Planning authorities are being asked to find a balance between appropriate infill development to support a growing population and housing choice while responding to neighbourhood character and amenity concerns of existing residents. It’s a difficult balancing act with many competing interests, made worse by under-resourced planning departments. Local Councils aren’t the only ones finding this ‘missing middle’ space difficult, with property developers finding themselves undertaking a similar balancing act in a high-risk environment with uncertain future land values, challenging funding conditions, continually changing residential planning policy and planning controls (that can wipe out the development yield and profit from a site overnight), reducing yields, increasing construction costs and highly subjective neighbourhood character objectives and planning controls – not to mention the ability for third party objector appeals to VCAT for essentially compliant proposals, which can add significant time and cost to a simple planning application. Based on the most recent ABS data, in greater Melbourne almost 70% of housing is conventional detached housing, with only 16.8% comprising townhouses and 14.7% for apartments. Plan Melbourne 2017-2050 states that 65% of all new dwellings will be in established areas, meaning middle ring suburbs will play a significant role in accommodating this housing growth. This data demonstrates that Melbourne has some way to go in providing the housing diversity, affordability and sustainable living for established areas as envisaged by State planning policy. It is evident that there is a need and desire to seek appropriate infill development in established residential areas to ensure the middle ring is contributing to fulfilling the 65% forecasted in Plan Melbourne 2017-2050. The residential zone reforms that have occurred over the past 5 years in Victoria has seen the introduction/removal of a two dwelling limit in Neighbourhood Residential Zones, introduction of mandatory garden area requirements, mandatory height controls and better apartment design guidelines. There is now talk of potential for the ‘two dwelling limit’ to return if there was a change of government later this year. This revolving door of planning controls makes development in Melbourne’s middle ring a game of roulette. Clearly, the middle ring is full of obstacles, hurdles and at times the unknown, but it is a location that has the greatest potential to accommodate future populations in high-amenity, well serviced locations. In an effort to reduce urban sprawl, planners and government authorities play an important role in facilitating (or allowing) the ‘right’ development to be located in the ‘right’ place. Whilst the middle ring may not be as easy or simple to plan for and develop as greenfield areas, when clear policy aspirations are set and planning controls are consistently applied and administered, this provides greater certainty for residents and developers, which assists in stimulating investment in higher quality development to benefit both existing and future residents, and create cohesive, prosperous, healthy and diverse communities. Mecone has been active in assisting property developers in the redevelopment of inner city and middle ring sites, and we see great value and reward in knowing that these projects are a true representation of good planning, offering future populations a level of housing diversity and affordability while maintaining and strengthening the high amenity and sustainable living environment that Melbourne has to offer. For example, our recent planning permit from City of Glen Eira for 15 two and three storey townhouses designed by Bayley Ward Architects in residential Murrumbeena is perfectly positioned close to public transport, open space and a local shopping centre while making a positive contribution to existing neighbourhood character. The site is a consolidation of three detached housing lots. The dwellings are generous in size, suitably sited and reflect high quality architecture and functionality that will offer high level amenity for future residents. The density and scale are responsive to the planning policy framework and existing and future neighbourhood character. With potential changes to limiting dwelling numbers on sites and the existing garden area requirements, it would be a shame to see sites like this be underdeveloped, and in years to come, be part of the outdated building stock representing a time where a lack of foresight and orderly planning led to underdeveloped sites. 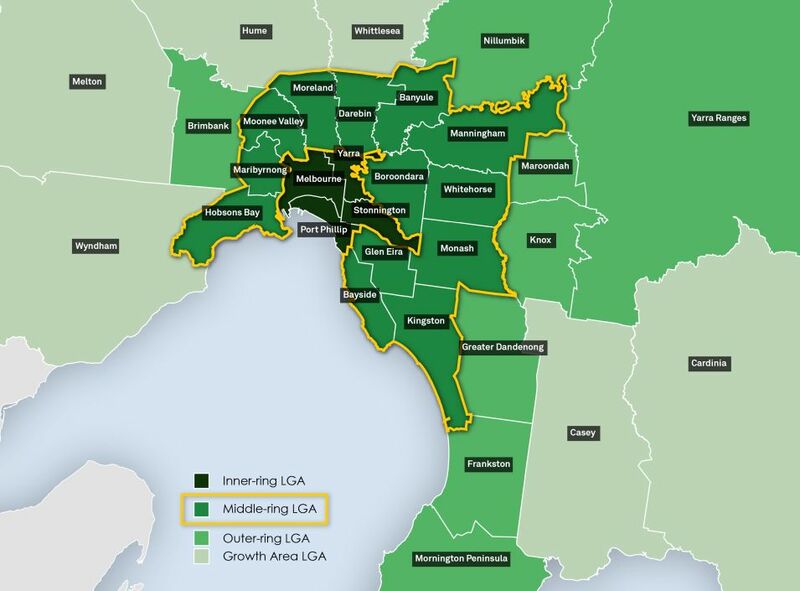 Considering the overarching housing density sought for metropolitan Melbourne, the proposal is seen as making efficient use of underutilised land and will assist in contributing to the much needed demand for well-located affordable housing. Article written by Rubin Winograd.